Tip: looking for this App in the App Store? Search on "Blackjack Expert". 11 unique training modes with configurable options. 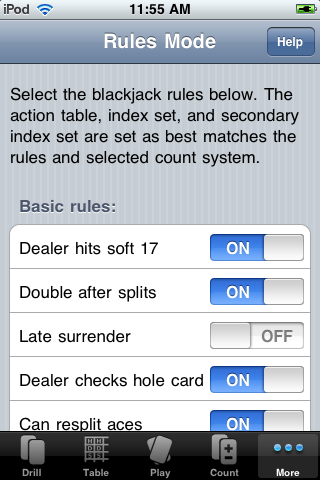 Every feature and mode found in Blackjack Mentor is also included in Blackjack Expert. Play Mode: Play Blackjack against the computer, while your decisions are checked along the way. Test yourself on the correct bets, actions, index plays and insurance. Drill Mode: Random blackjack hands are displayed, and you have to pick the correct action. The program remembers which ones you get right or wrong, and tends to pick the ones you are having the most problems with. Add count values to help master index play deviations as well. Table Mode: View all of the basic strategy plays. The hands are broken up into hard hands from 8 to 16, soft hands from Ace-2 to Ace-9, and all pairs. 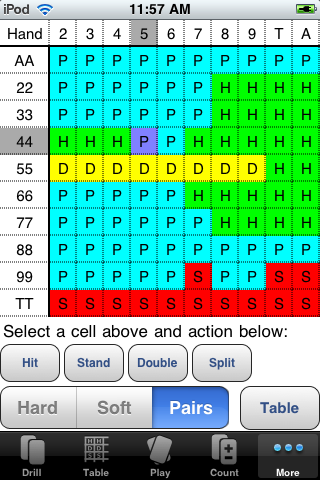 You can select specific hands to be tested on, and view your error statistics from Drill mode. 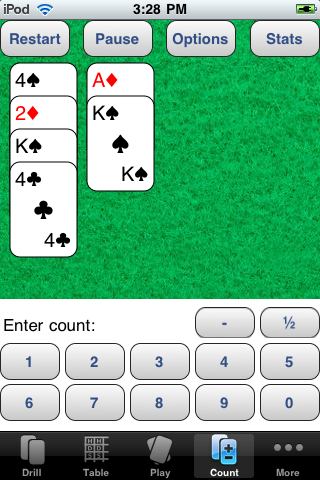 Memorize Mode: Displays an empty blackjack strategy table and lets you fill in the correct plays one cell at a time. If you get the action wrong, it tells you and marks the error. 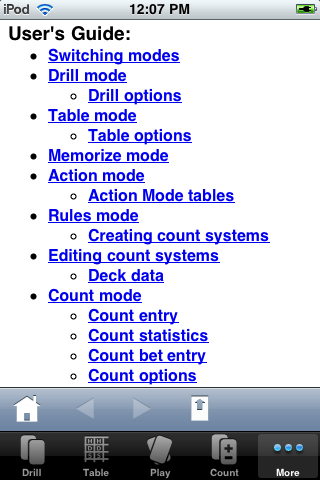 Count Mode: Configurable count-down deck drills help you track the count quickly and correctly without errors. 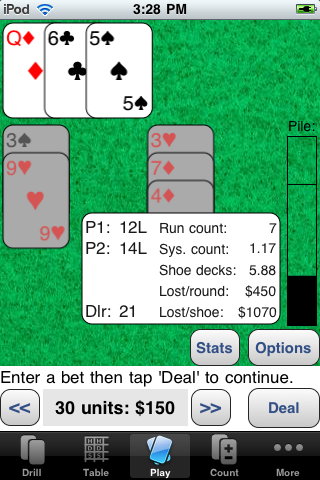 Many user options to setup your training, such as timed or untimed drills, test for bets, number of cards, table or hands display. Rules Mode: Choose from a wide range of blackjack rules for DAS/noDAS, S17/H17, surrender, ENHC, number of decks, and double restrictions. A matching optimal basic strategy table is automatically selected for you. 144 built-in action tables ready for you to use. Select a count system and game rules, and the matching action and index tables are selected automatically. Action Mode: Create or modify your own action table. Includes all of the OBS strategy tables for the Speed Count system, and 144 built-in action tables for every common rule-set variation. Index Mode: Specify index sets containing play deviations for different hand combinations, based on the system count. Several basic index sets for different count systems are included, or create your own. Count Systems: Use any of the included count systems: High-Low, KO, Speed Count, Uston Ace-Five, Uston Advanced, and more. Or, create and edit your own count systems. Supports multi-level counts, fractional count values, red/black card assignments, balanced systems, unbalanced systems: everything for professional card counters and novices alike. Add-on Databases: Extra count systems are available as In-app purchases. The complete High-Low system with all index sets, OmegaII level 2 advanced, and HiOptI are available. Help Mode: All the rules of blackjack, an introduction to card counting, and detailed documentation on the program, presented in a rich web browsing format. Everything you need to know to play perfect blackjack. Context sensitive help is available in most windows to help you immediately with any feature. Blackjack Expert for iPhone includes every feature found in Mentor, Counter and Expert for our other platforms: everything you need to master card counting in one program! I already own Counter and/or Expert for a different platform/OS. Do I have to pay for the iPhone version? Yes. 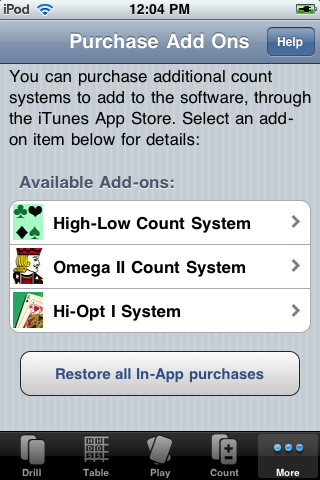 The iPhone version requires a new purchase for all users, and is only available in the Apple App Store. Apple does not provide any customer information to developers, nor do they offer any discounting mechanism, so we cannot provide any discounts to existing users. Can I get a discount for the iPhone version, since I have purchased other products from your company? No. Apple does not provide any customer information and requires all developers to only list their iPhone products in their store, so we are unable to provide any existing customer discounts to the iPhone versions of our software. Can I download and purchase this software directly from your site, instead of the Apple iTunes App Store? No. Apple requires all developers to exclusively list their iPhone products in the Apple App Store. Click the purchase links above to buy and install this software from the App Store, or search on "blackjack expert" in the App Store on your device or iTunes. Can I try out the iPhone version prior to purchasing it, like your products on your other platforms? No. Apple does not allow shareware software in their store. 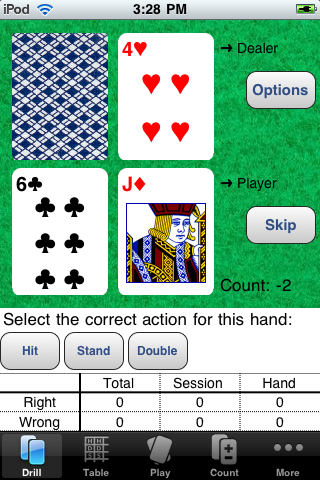 Blackjack Expert for iPhone has all of the features of Counter and Expert combined in one easy-to-use App. Is Blackjack Expert for iPhone the same as for other platforms? Yes, and it includes many other useful enhancements to the user interface to make training and mastering card counting even easier. A Rules Mode has been added to make the process of setting the game rules easier, and table/index set selection is automatic. Numerous UI enhancements are available throughout the App. All the usual training modes are available, and the ability to create and edit count systems is there as well. Will you be coming out your blackjack training products for Android, Blackberry, Windows Mobile 7, etc.? Eventually, we hope to do so. Each of these platforms represents a significant investment of time and energy to port our product line to. We are watching and evaluating the market share for each of these platforms to help guide our decisions in this regard. I use Speed Count. Do I have to purchase anything extra with the iPhone version? No. 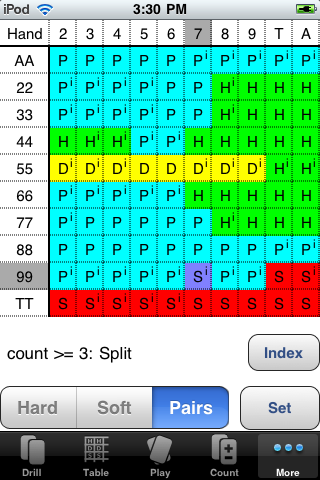 Blackjack Expert for iPhone includes the complete Speed Count system, even the modified OBS strategy tables (select them in Action Mode, Tables button.) Unlike our other platforms, there is nothing extra you have to purchase or add-on for Speed Count. Are add-on databases available for HighLow and other count systems? Yes. Visit the Add-ons mode accessible from the 'More' tab on the main tab bar to purchase additional count systems. Can I use this program while playing in a casino? We do not advise that you use this program, or any physical device as an aid, while actually counting cards in a casino. To be clear, this program (nor any product our company produces) does not help players track the count while playing. 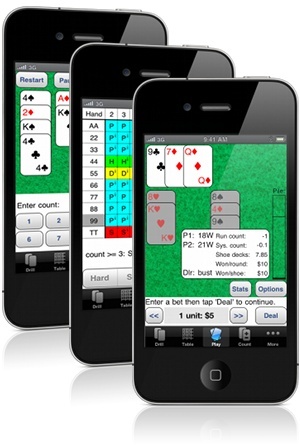 The features of this program only help players learn how to count cards in blackjack, and this App is intended to be used outside of the casino as a training program only. Using a physical device in a casino as an aid to playing, whether concealed or not, is a serious crime in virtually every legal gambling jurisdiction in the world. We do not even recommend that you consult this program to check on basic strategy, as most casinos these days do not allow electronic devices at the tables.